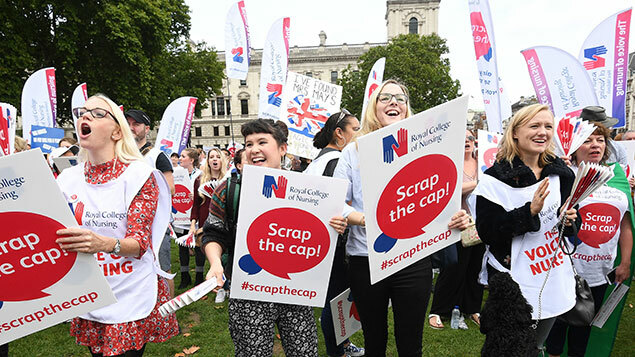 Nurses protest over the 1% public sector pay cap earlier this month. The Government has confirmed it will end its 1% annual cap on public sector pay next year and, this year, reward police and prison staff with a 2% and a 1.7% rise respectively. Half of the police rise will be in the form of a one-off bonus. Prime Minister Theresa May’s spokesman said that there would be more scope for flexibility with public sector pay from 2018-19, signalling that public sector workers in other sectors could also see rises of above 1%. The spokesman added that the pay rises may be linked to “improvements to public sector productivity” and that the specific remit for the various pay review bodies over the wage levels they could set would be established as part of the budget process and revealed in the near future. The pay awards would come from existing Home Office and justice ministry budgets, the Government confirmed. Treasury minister Liz Truss said that hard working public sector workers deserved to be “fairly rewarded” and that special consideration was to be given to areas of the public sector where there were staff shortages. The TUC and Prison Officers Association, however, criticised the amount of the pay rise because it is beneath the rate of inflation announced today: 2.9%, the joint highest figure in five years. The Police Federation had requested a 2.8% increase in basic pay and the POA, whose general secretary Steve Gillan had stated that his members had suffered a £4,000 cut in pay since 2010, had wanted 5%. TUC general secretary Frances O’Grady described the below-inflation offers as “pathetic” and Unison said that although it was a “tiny step in the right direction” it was “not nearly enough”. Liberal Democrat leader Sir Vince Cable said he was glad that the Government had recognised that the pay cap was no longer sustainable and urged ministers to ensure all public sector workers “are given the pay rise they deserve”. Public sector pay was frozen for two years in 2010, with the exception of those on less than £21,000 a year, and since 2013, rises have been capped at 1% – below the rate of inflation.